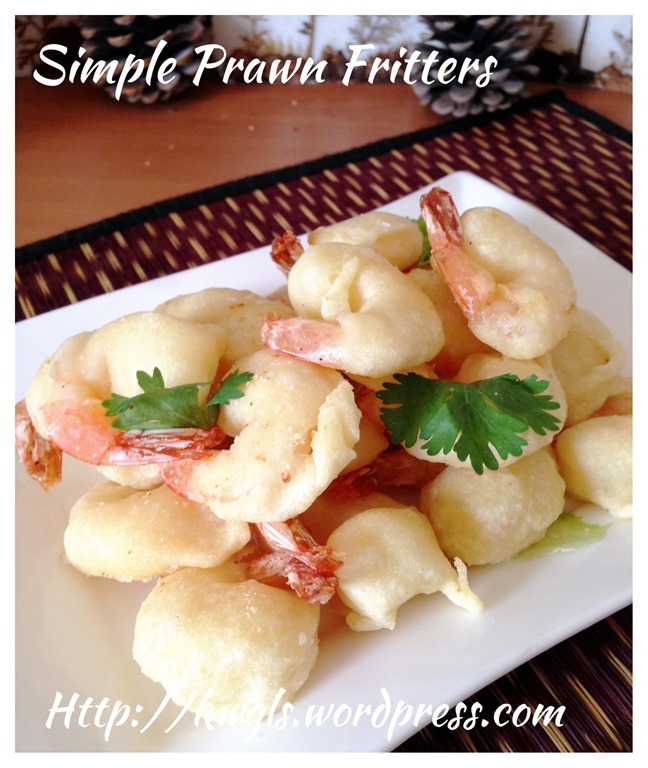 On second thought, I think a lot of new house chefs may have problems of deep frying prawns fritters that are fluffy and stay crispy even when it is cold. 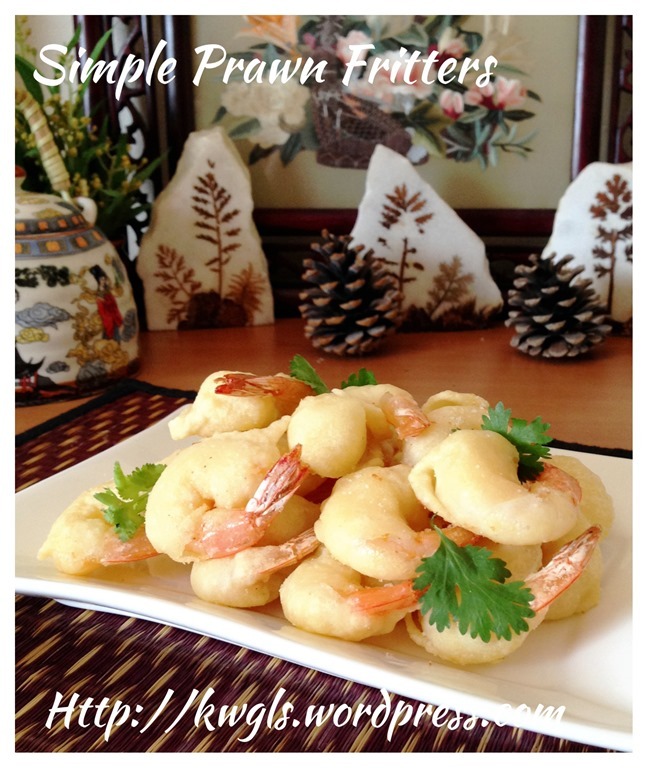 I did not learn all this from my late mum, I have many trials and errors before I came out with this recipe that I have used it for almost all types of fritters be it fish, banana, nian gao and other fritters. On this ground, I believed a lot of new house chef may face the same problem as me. Of course, you can always buy ready packed deep frying powder from the supermarket to do the job. However, is it not good if we can easily do it at home when the craving arises? In addition, this can be prepared at a fraction of cost and you can adjust the seasoning to suit your taste buds. There is nothing much to write about this recipe. 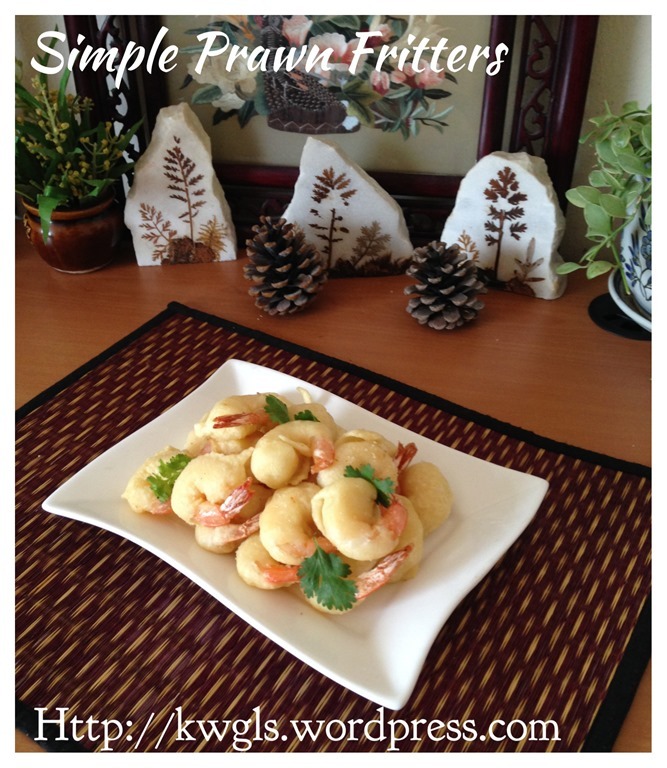 It is just a common household dish for smaller prawns that is well liked by most families. For this illustration, I have added some white pepper salt (椒盐） – a standard combination of seasonings for some deep fried items in Chinese recipes. Therefore, the batter is rather tasteless because salt and white pepper will be sprinkled on top of the deep fried fritters. On the same logic, if you do not have such ready made seasoning, you can always add salt or white pepper or other seasonings to your batter. 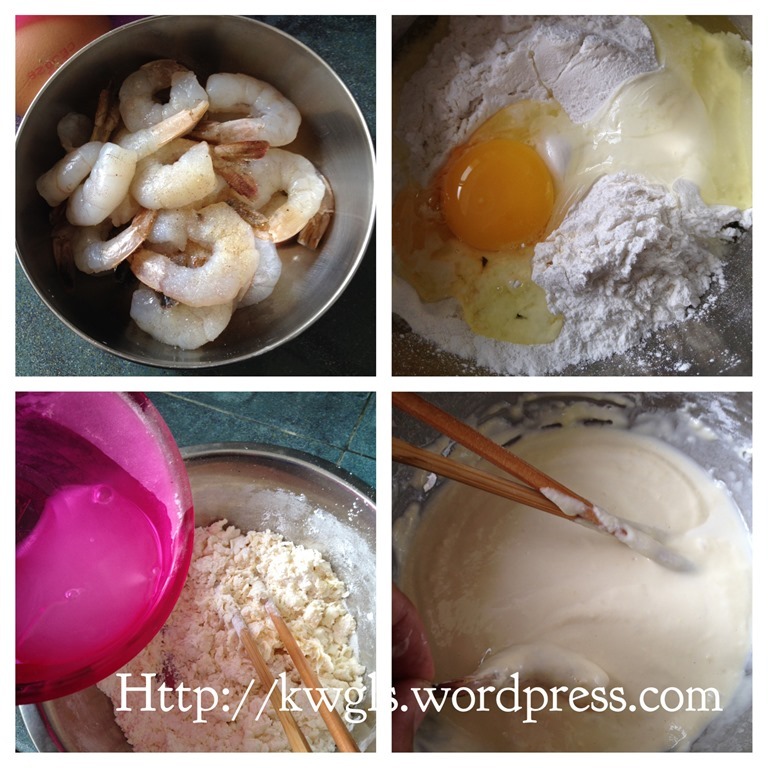 Add pinches of salt and dashes of white pepper to the prawns. Season the prawns for at least half an hour in the fridge without cover. After half an hour, your prawns shall be rather dry and ready for deep frying. If you are running short of time, pat dry the prawns with some kitchen towel and add pinches of salt and dashes of white pepper. 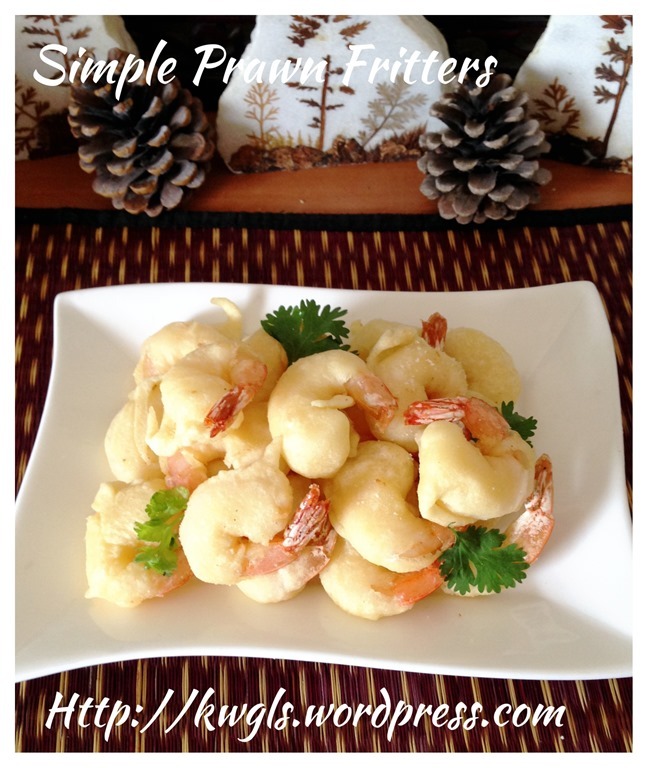 In a bowl, sift in the rice flour, baking powder and plain flour. Crack the eggs and add in seasonings of your choice (optional), dashes of white pepper and pinches of salt. Gradually add in the water and whisk until well mixed. The batter shall be rather thick such that it can stick to the prawns. In the even it become too watery, you have to add some more plain flour. Heat up a pot of hot oil. The oil is considered as ready when a pair of wooden chopsticks inserts into the hot oil, bubbles starts to emit. 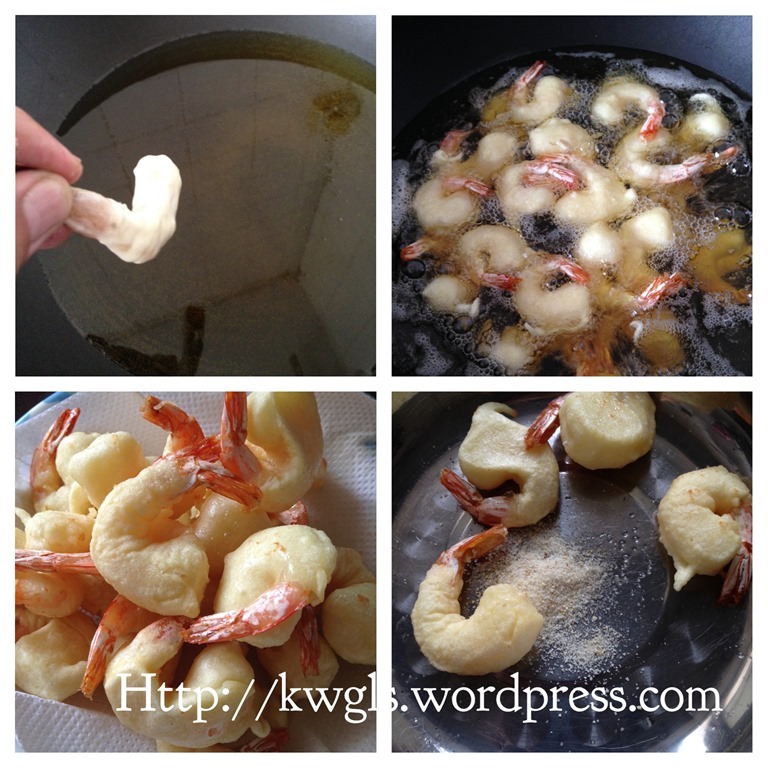 Take a piece of prawn and put in the hot oil. Reduce the heat to medium heat. Perform the same for all the prawns. Deep fried the prawns fritter until golden brown and just before taking out from the hot oil, increase the heat to high. 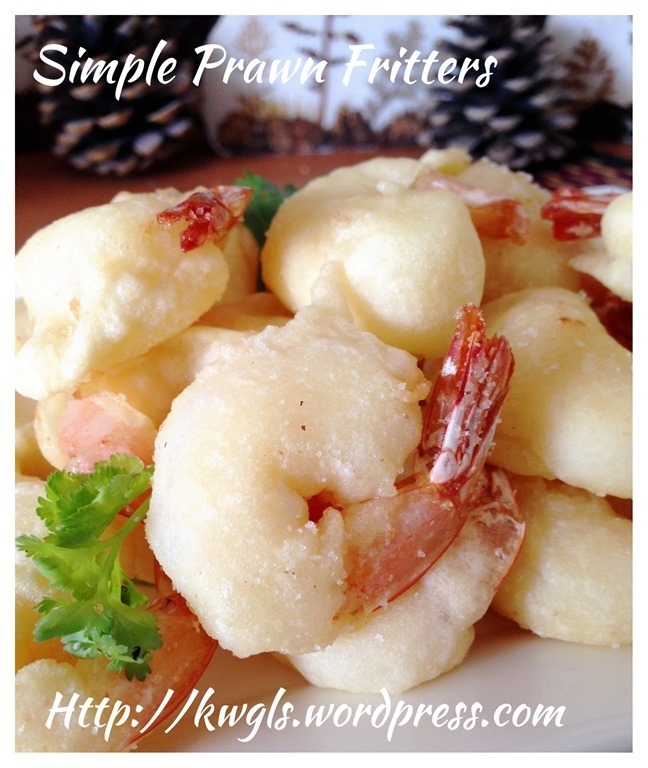 Take out the prawns fritters, drained and sprinkle of salt pepper seasoning (optional). Cool completely before serving. In the process of deep frying, you will witness changes from lots of big bubbles into minimal small bubbles. When there are almost no bubbles, the fritter is ready. However, you have to watch out the colour tone also. Therefore, you have to keep an eye during the whole process of deep frying. 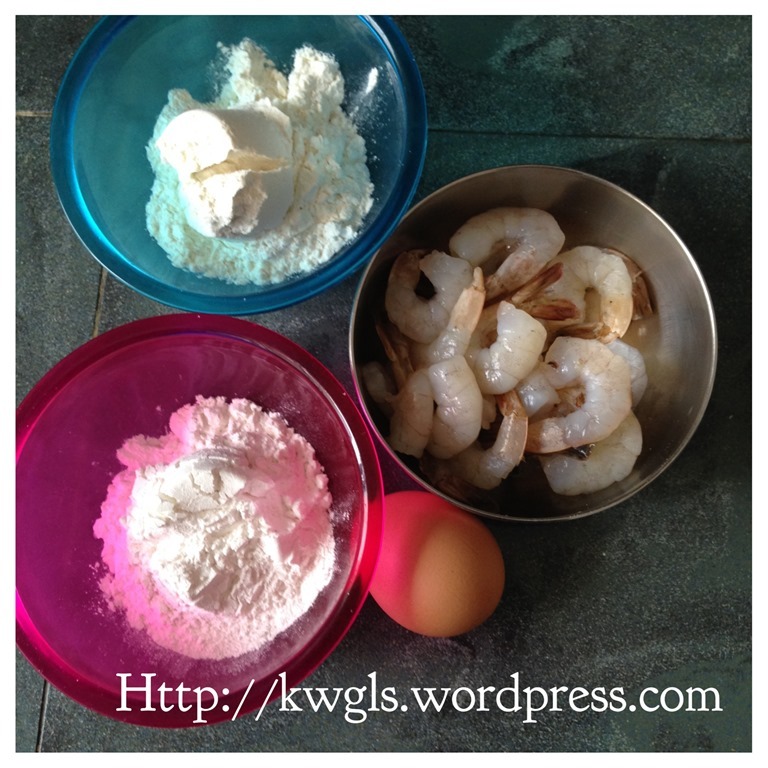 The prawns will have to be dry such that the batter will stick to the prawns. 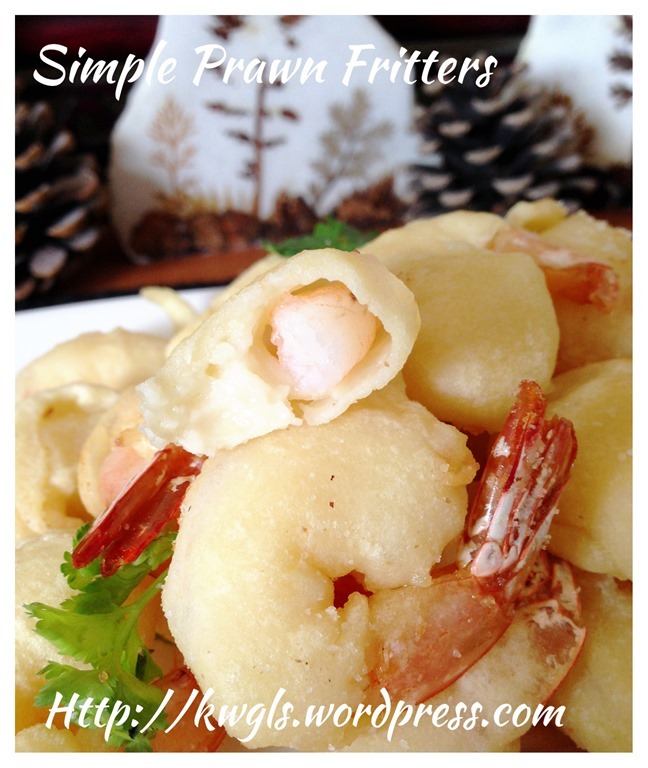 This prawn fritters are rather crispy even when cold. 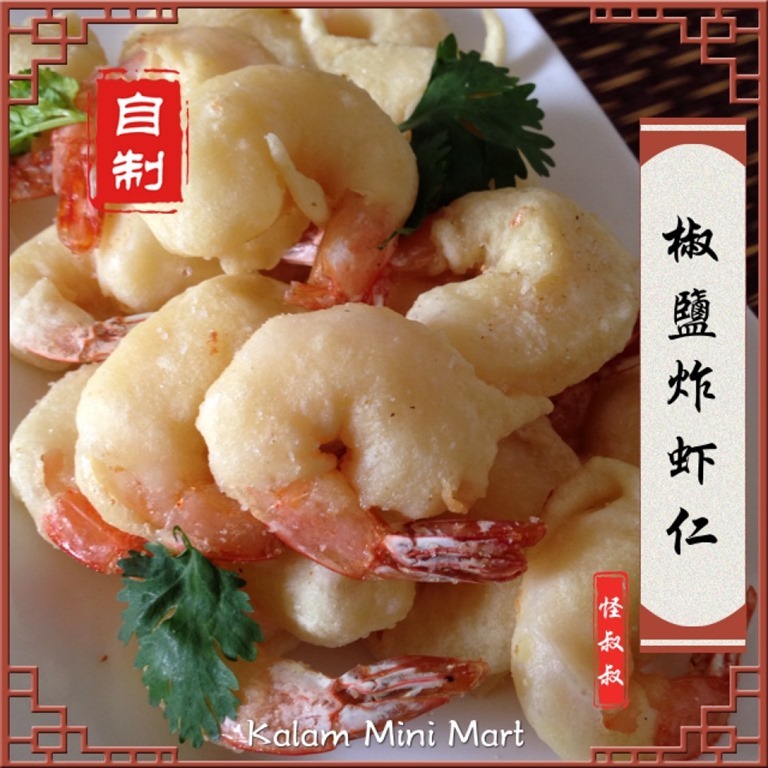 Remember that the prawns need to be dry and adding rice flour will help to maintain the shape. 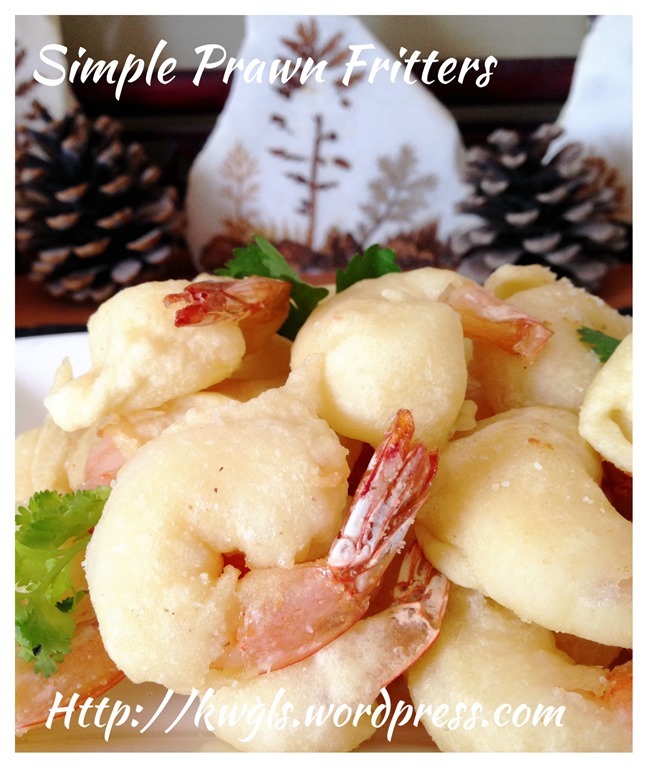 It is my sincere wish that this recipe will benefit new house chefs who are struggling to get the best batter for deep frying . 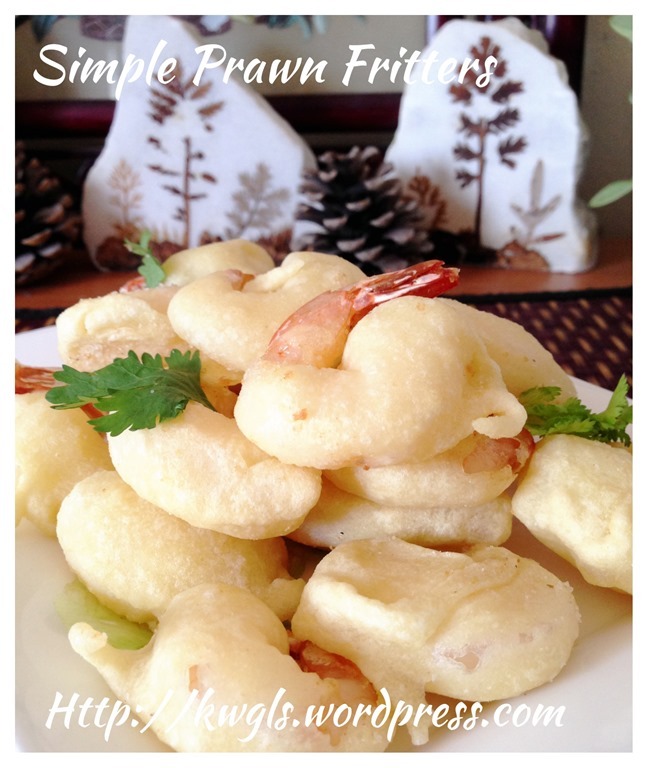 Remember that you can use this recipe for deep frying fish, chickens, vegetables etc. but the timing will have to be adjusted accordingly. 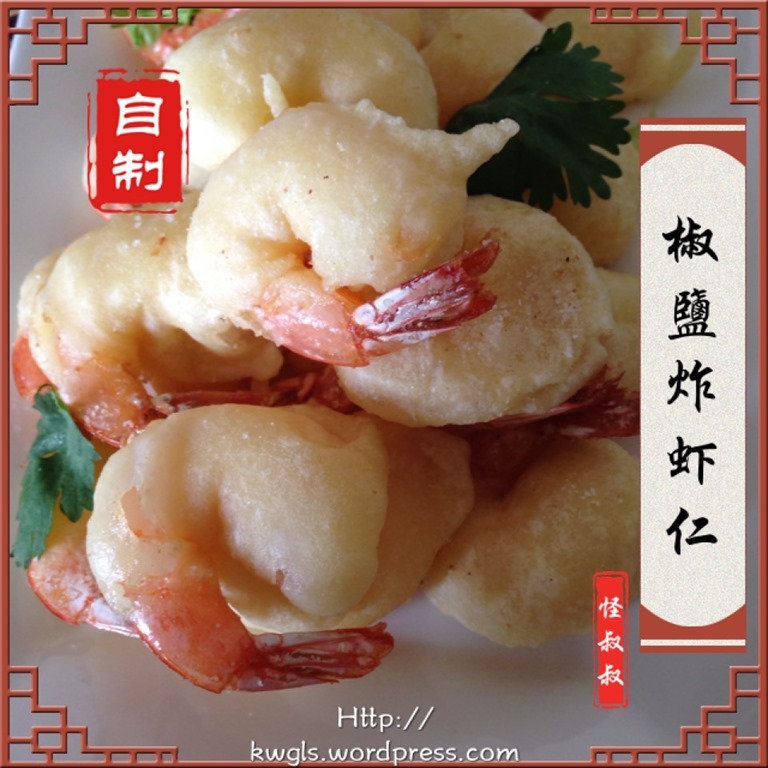 This entry was posted in Dish, Food Preparation Series, Seafood Dishes and tagged 8, GUAI SHU SHU, Guaishushu, kenneth goh, postaday, prawn fritters, 椒盐炸虾仁， 酥脆炸虾. Bookmark the permalink.